The story of Carrie White, first told by Stephen King in 1974 in his best-selling novel, is all-too-familiar and creepily close to reality, especially for a teenager like myself. Bullying is straight-up terrifying. That said, I appreciate the story and enjoyed the original movie based on King’s novel, featuring Sissy Spacek in the title role. As we made our way to RVA Event Space in Plant Zero, my older sister and I discussed our doubts about the production we were about to see: the visual effects would be a challenge on the small stage; the plot demands require a talented and versatile ensemble; and the content is so dark – how would it translate into the musical genre? By the time the first act was over, our fears had disappeared. Carrie: The Musical is freaky, sad, enjoyable, and kind of charming. The songs were catchy, especially the opening number, “In,” and “The World According to Chris,” anchored by lead bully Chris Hargensen (Grace Mincks). 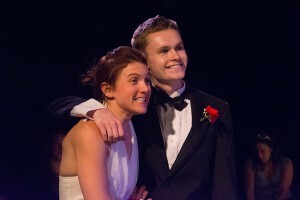 The hopelessly confused Sue Snell (Emily Sargeant) and her boyfriend, Tommy Ross (Sean Dunavant) were an interesting stage duo and added to the mystery of the production. The highlight of Carrie was its two leading ladies: Brittnay D. Simmons as Carrie and Andrea Rivette opposite her as Carrie’s deranged, religiously fanatic mother. The scenes between them were captivating and, as the play went on, horrifying. Both voices were so powerful that they filled the room during duets, which added to the terror at the climax. We enjoyed this play immensely – but it isn’t for everyone. There are sexual references, blood, foul language, and cruel themes throughout, combined with that infamously tragic ending for our characters. However, I’ve loved the movie for a couple years now and mature teens should be exposed to this kind of material, especially in this artful presentation. 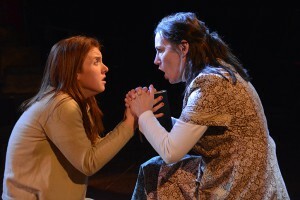 Carrie: The Musical is a play that manages to be heartfelt, intriguing, and most of all, scary. Recommended for ages 15 and up. Carrie: The Musical, directed by Billie Christopher Maupin from 5th Wall Theatre, is playing at RVA Event Space, Plant Zero, through August 8. Click 5th Wall for tickets and showtimes.